I order coffee and toast, John John gets pancakes. I was working in the yard, fertilizing some yellow cauliflower plants. I stepped in a hole leftover from when we pulled out tomato plants and I fell to my side. It felt like i tweaked it. I was in a wheelchair or bed ridden. I had a lot of work to finish before Christmas. Its cool to be on the radio where i can have a voice and it doesn’t make a difference that i’m disabled..i like playing records too. My air name is Hemroid The Leader. i’ll explain later. The stream is up for 2 weeks. I’ll be attending MS Breakthroughs with Jeffrey Dunn on Saturday January 26 in San Jose. I’ll bring some flyers in case somebody wants to hear a podcast. Join us to learn about our progress this past year in accelerating breakthroughs for people affected by MS, what’s in store for the year ahead and enjoy a research update from our keynote speaker Jeffrey Dunn, MD, Professor of Clinical Neurology and Division Chief of Clinical Neuroimmunology at Stanford Neuroscience Health Center at Stanford University in Palo Alto, California. He serves as the Chair of the MS Section of the American Academy of Neurology and serves on the National Medical Advisory Board of the National MS Society. Other episodes at whatsthematterwithme.org, iTunes, or wherever you get your podcasts..
JOHN: Welcome to the What’s the Matter with Me? Podcast, season three, episode one: Something Happened At Bill’s Cafe. 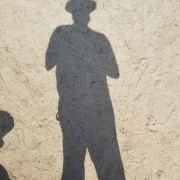 My name is John, I’m 39 years old, husband and father of two, small business owner, radio DJ, podcaster. And I have multiple sclerosis, so I made this podcast to share what I’m going through. The What’s the Matter With Me? Podcast Is an MS Podcast, and it’s also about other things. Past episodes are available for download on whatsthematterwithme.org, iTunes, and wherever you get it. I’m not a medical professional and you should not take this for medical advice. If you need medical advice, ask your health care provider. Recap, recap, I post … man, I get too excited sometimes. Recap, I posted live from the Petaluma Smart Train Station. Check it out, surf on over to whatsthematterwithme.org, season two, episode 16. Check it out. Gotta give big shout outs, big, many thanks, shout outs to Rocky, Shauskin and Patrick, and most of all, especially Nami. Shout outs. You know, something happened at Bill’s Cafe. I felt that morning when I woke up, I was by my bed getting dressed. It felt kind of strange when I put my pants on. I checked it out. In the leg with my brace, I was putting it on, it felt kind of weird. Then I had my morning, I went ahead, I dropped Coco at school and parked there, walked from the car to the classroom. I was with John John. We all went. I dropped her off, everything was cool, everything was normal. And I took John John to the dentist, and I’ve read, probably on my phone in the waiting room, and it’s all good. It was done and he had a good appointment, we went back to the car, everything normal. Bill’s Cafe. I went to Bill’s Cafe. Bill’s Cafe is a popular, like, brunch chain around here. So I wanted to take John John for some pancakes. He did good at his dentist appointment and I wanted to reward him. So I ordered coffee and toast, and John John got the pancakes, and then I felt a tap on my shoulder, and I looked out and I was like, no. And the host, the host was there. It’s 11:00 AM, there’s like a coffee shop vibe all around. People who were eating Brunch at 11:00 AM on a Tuesday, you know, it’s an interesting scene. It’s like retired people, and weirdos. And my dirty underwear that I wore yesterday is in the middle of the floor. The guy is like, “Excuse me sir, is that your underwear?” I’m like, “Why yes it is,” you know, and so I got it, I stuffed it, I mean, what do you … I can’t be like “No, clean it up,” right? So I stuffed it in my pocket, and I played it off, and I knew I was just like, this, this is like, so … I’m mortified, right? But I’m like, no, do not be mortified. Just play it off. And I played it off, but the pressure was high. My something happened to Bill’s Cafe, my dirty underwear was it. And I felt weird putting my pants on in the morning, you know? Always check your pants I guess, or I don’t know what the moral is here. Okay, well that’s out of the way. Before the holidays, I had a pretty bad accident. One Sunday morning I was working in the yard, and I was fertilizing some yellow cauliflower plants. We got some yellow cauliflower plants cause we were like, they’re weird color. I thought the kids would dig that. So we also pulled up the tomato plants when we planted the cauliflower, you know, and the tomato plants leftover from the summer, they were big, you know. So they made holes when we pulled ’em up and we forgot to fill ’em I guess, we didn’t really even think about it. And when we pulled out the tomato plants, then I stepped in the hole and fell to my side. And I kinda felt like I tweaked it. It was really hard to get up. Of course I was just about to leave the house so I got mud all over myself. I had to go inside and change and clean my shoe because I got to wear it ’cause my brace is in there. So I was totally a mess, and it kind of felt like I tweaked it. I went to Oakland, and I met this rad dude, BJ Miller. I’m going to talk about him maybe next episode. And by the time we got home that night, you know we’ve been out all day. It was kinda cool, but then all of a sudden I couldn’t walk. I couldn’t put any weight on it. And then it was just, we had to go to the hospital, get crutches, that didn’t work. So we got a wheelchair, and it took like five days. Nami helped me get up and wake up, go to the bathroom, get dressed. I was like a mess. And my buddy Manny, he helped me out, came by in the daytime, hanging out at dinner. He was cool, and it was super tough to be in a wheelchair, and bed ridden and … ‘Cause I had kind of tweaked my left hip and my left leg is the one that’s useful. So it was kind of … it was very touch and go. So I was bed ridden and I had a lot of work to do before Christmas, but I couldn’t do anything. I’m on pain meds and it was hard. And people helped me though, and am really grateful that I’ve recovered, but I had a bad accident. I was not digging that. I was on the radio. Last Friday I hosted the jazz collective on 89.7 KFJC.org. It’s a jazz show. This morning at 4:00 AM I got this message: “Yo, your jazz collective was the stuff, man. I played all of it while cooking dinner and hanging out with friends. Nice balance of easy listening and skronk. OMG it was so phat.” It’s cool to be on the radio where I can have a voice and it doesn’t make a difference, any difference at all, that I’m disabled and I like playing records too. I have a good time. Check it out. Jazz collective last Friday, you can get it from KFJC.org. Just go to the homepage. Click on more from the archive, and my air name is Hemorrhoid the Leader. I guess I’ll have to explain that later. On Saturday, January 26th in San Jose, I’ll be attending MS Breakthroughs. It’s an event put on by the MS Society. I’ll bring some flyers in case somebody there wants to check out a podcast. MS Breakthroughs: join us to learn about our progress this past year in accelerating breakthroughs for people affected by MS, what’s in store for the year ahead, and enjoy a research update from our keynote speaker Geoffrey Dunn, MD, professor of clinical neurology and division chief of clinical neuroimmunology at Stanford Neuroscience Health Center at Stanford University in Palo Alto, California. He serves on the chair of the MS section of the American Academy of Neurology and serves on the National Medical Advisory Board of the National MS Society. Jeffrey Dunn at Ms Breakthrough, San Jose, California, Saturday, January 26. The Courtyard by Marriott, San Jose, North Silicon Valley. 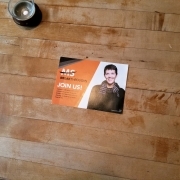 Register at nationalmssociety.org. For sure I’ll let you know how it goes. Thanks for listening. Thanks for tuning into The What’s the Matter With Me podcast. Other episodes are at whatsthematterwithme.org, iTunes, or wherever you get your podcasts. Check out more of my music on soundcloud.com/John-Hoppin. That’s J-O-H-N dash H-O-P-P-I-N. And of course sponsor, word from our sponsor. Hoppin Hot Sauce, it’s the best hot sauce. Hoppin Hot Sauce, it’s the best sauce in the world! That we’re not telling you! Makes every plate great, hoppinhotsauce.com. Season three, episode one in the books. Thank you for listening to the What’s the Matter With Me podcast. I got a new brace from a disabled provider; I am a creative person and for me that means I must take charge of my own representation in order to be who I imagine; Hoppin Hot Sauce is advancing, and I’m getting more disabled and simple things are getting harder. Shoutouts to Rocky- always listening; Kyle fromTwo Disabled Dudes podcast, to my wife who worked hard at the Harvest Festival and every other day too. Email me and I will give you a shout out free of charge. Hoppin Hot Sauce Youtube channel, and I went on vacation to a wedding in Malibu. let’s get into it. We went to the Harvest Festival at Marshall Cottle Park in San Jose, organized by San Jose Made, a local organizer of maker events and craft fairs. 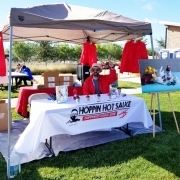 We set up a booth for Hoppin Hot Sauce, with bottles, poster easels, and myself and my wife passing out samples.. My goals were #1- to represent the brand and #2- to sell some sauce. We did well. It was 5 hours of talking, very tiring and I slept the whole next day. Next time I will be sure there are two people with me, not just me. I am no good to fold a popup canopy no matter how easy it is. i made a video about it and put it on the youtube channel. I started the Hoppin Hot Sauce youtube channel. I made two videos: the zipa, and the harvest fair recap. i’ve been directing a lot of my energy that way, learning software i haven’t used in 15 years, learning about putting it online. I like it because I can tell my brand’s story, speaking directly to the customer, and also say things that are positive representations of disabled people. I went to malibu for a beautiful wedding under a big palm tree at a glamorous house overlooking the ocean. they were my wife’s oldest friends, they had grown up scampering over the fence to each other’s house in 1980s southern california. I’m working on some new products for Hoppin Hot Sauce , one is a spicy salad dressing which seems crazy but people often remark to me that they put it on salad. when it was time to make lunch today i cubed up some leftover tritip, tossed it with arugula in a bowl, and put spicy salad dressing on it, some walnuts and raisins, and it was pretty good. I’m in mad scientist mode: I’ve got some ideas, and I’ll keep going. I’m also doubting myself constantly like always. The struggle is to move forward and to be comfortable with the unknown. i must always remember- move onwards. Welcome to the What’s the Matter With Me? Podcast, season two episode 14. My name is John, I’m 39 years old, a husband and father of two. Small business owner, radio DJ, podcaster, and I have multiple sclerosis so I made this podcast to share what I’m going through. What’s the Matter With Me is an MS podcast and it’s also about other things. I’m not a medical professional and you should not take this for medical advice. If you need medical advice, ask your healthcare provider. Recap, recap. Last episode I got a new brace from a disabled provider, what that means is like the doctor lady in the co was disabled, I thought it was cool. I’m a creative person, I figured this out. Well I knew I was creative but I realized for me that means I must take charge of my own representation in order to be who I imagine. Hoppin’ hot sauce is advancing and I’m getting more disabled at the same time. Simple things are getting harder. It’s that time now, it’s that time. Gotta give shout outs. Shout outs to Rocky, always listening. Shout outs to Kyle from Two Disabled Dudes podcast and to my wife who worked so hard at the harvest fair and every other single day too. Email me, john@hoppinworld.com and I will give you a shout out. Probably free of charge. Definitely free of charge, you can download the What’s the Matter With Me podcast on Apple podcast and on whatsthematterwithme.org. I’ve been off the air for a few weeks. I’ve been busy though but definitely prostrate myself. I’m sorry to you. But here it is, here’s a new episode. In the meantime I’m gonna tell you what went down, I took hoppin’ hot sauce to a harvest festival and I started a hoppin’ hot sauce YouTube channel, and I went on vacation to a glamorous wedding in Malibu, so let’s get into it. We went to the harvest fair in San Jose here, organized by San Jose maid, a local organizer of maker events and craft fairs. So they have a harvest festival every year at harvest time, around this time and they set up an arcade of vendors who sell candles and gluten-free baked goods and stuff. We went last year, and I was like I wanna be in there, I want hoppin’ hot sauce to be there. So this year I applied and we set up a booth for our hoppin’ hot sauce bottles and posters on easels, and myself and my wife passing out samples and selling bottles. My goals were number one, to represent the brand and number two, sell some sauce. And we did that. We did well, I was happy at the end of the day. But it was five hours of talking, it was so tiring. I slept the whole next day and next time I bring the hoppin’ hot sauce tasting experience out in the open like that, I have to be sure there are two people with me, not just me. Because I’m no good to fold even a pop up canopy no matter how easy it is. I made a video about the harvest fair and I put it on my YouTube channel. What’s that, what’s that about a YouTube channel? I started the hoppin’ hot sauce channel. I’ve made a couple videos so far, one is about the zebra who’s like the ancient king of Lake Guadaveda who started the myth of El Dorado or the myth of El Dorado centers around the zebra. And I made another one about the harvest festival recap, about the square dancers and the goats and other stuff. Check it out. It’s the hoppin’ hot sauce YouTube channel. I’ve been directing a lot of my energy that way. Learning software, relearning software about video editing that I haven’t used in 15 years and I’m learning about putting it online. And I like having the video medium because I can tell my brand story speaking directly to the customer and also I can say things that create positive representations of disabled people. Check this out. 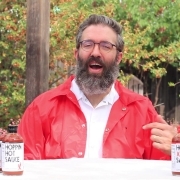 Thanks for watching the pepper show, I’m John Hop and I make hoppin’ hot sauce, check it out at hoppinhotsauce.com. I have multiple sclerosis, it made it hard to work in the kitchen but it didn’t stop me from cooking. I made hoppin’ hot sauce to share the taste of my table with yours. Check it out, get some at hoppinhotsauce.com. All right, see what I’m saying? I think that there’s something powerful about that, it’s telling my story, it’s who it is. Take it or leave it. I did this, I won’t stop. If you’ve been listening to my podcast you know nothing, I’ve decided over and over that I won’t stop. I’m sorry I took a break. I went to Malibu with my wife to a big beautiful glamorous wedding under a palm tree at a big white house overlooking the ocean. The bride was my wife’s oldest friend and she’d grown up scampering over the fence. 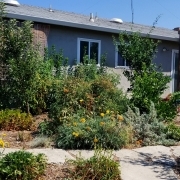 They both scampered back and forth to each other’s houses in 1980s Southern California. It was cool to hang out with this lady and her family and meet her husband and it was cool to get a glimpse of all these people that my wife had told me so much about. And it was cool to be in Malibu. I even hit up the weirdest spot, I had the weirdest day in Thousand Oaks. I went to a place called the Record Outlet, which is a used record store in Thousand Oaks. It was awesome. And then for lunch I was like I don’t know anything, let’s go to a pub. You know how it is, you don’t wanna like look stuff up, I didn’t wanna see about the rating or whatever. So I just went, we went to this pub and it was like Hooters and it was a big room full of guys watching horse racing and another room full of college football and there was like betting going on and the ladies, it was called, what was the theme? Scottish Hooters. So everything was out there, it was just … we each had a beer and we split the spot. It was weird but the record store was really cool. Record Outlet in Thousand Oaks, I wanna go back. That was not a paid advertisement, I just like used records stores. I’ll go to a used record store any day. I’m working on some new product, I’m working on some new products for hoppin’ hot sauce. One is a spicy salad dressing which seems crazy but people often tell me that they put the sauce on salad. So when it was time to make lunch today I cubed up some leftover tri-tip steak, I tossed it with arugula in a bowl and put spicy salad dressing on it. Some walnuts and raisins and it was pretty good, I’m in mad scientist mode now. I got some ideas and I’ll keep going. I’m also doubting myself constantly like always. Maybe I should just give up. But the struggle is to move forward and be comfortable with the unknown, and I have to always remember onwards. Thank you for listening to the What’s the Matter With Me podcast, that’s another one in the books. You can download What’s the Matter With Me podcast on Apple podcast and on whatsthematterwithme.org. Thank you for listening. General confusion and the inability to think of anything much at all last week. I felt like giving up on Hoppin Hot Sauce. It was too hard and nobody wanted it anyway, I thought. I went on for some days like this and I think it may have happened the week before as well. I really felt like quitting and giving up everything. And what was so annoying was I couldn’t even have a thought about that, to evaluate it. There were no brain waves. I started to question my medication., because I was feeling so bad. Then on Thursday at the end of the day suddenly I snapped into action and begin to realize just how much I had to do. I had to pay some people and sell sauce and balance my books. I got a haircut and I’ll probably cook dinner for the family. I think it’s going to be vegetable pasta with tomatoes and grilled zucchini and roasted red bell peppers because we have all that around. And lots of Parmesan cheese. On the advice of my therapist, I started taking antacids with my afternoon pills, not an empty stomach, and I saw an improvement. I no longer question reality all afternoon. What does my day look like? What does my dad look like? What does my d*** look like? Why doesn’t artificial intelligence know what I need to see first thing in the morning? In short, antacids are getting it done, and artificial intelligence still leaves much to be desired. Check out the Whats The Matter With Me? podcast page on Facebook, please review it and like it — help me get the word out. Contact me here. Shoutouts to Nat – happy birthday! Shoutouts to Patrick, thanks for the vacation tips, shoutouts to shannon – thanks for reaching out. Q: Why are you interested in disability advocacy? What are 1-2 issues that are important to you and why? Too often disabled voices go unheard. We are discussed but we aren’t part of the conversation. I have always believed that direct action is the fastest way to instigate change. Our voice is marginalized, and using our voice will make it stronger. As we tell our stories in our own voices, we create our own representation. We’re represented as living a life not worth living, wirh meager intellectual abilities, unfeeling and incapable of love; as purposeless mistakes. This distorted simplification is very unfair to say the least. To avoid it, we must take back the way we are represented. We are our own best advocates. In 2017, I created the What’s The Matter With Me? 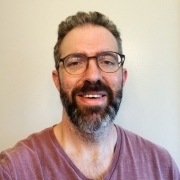 podcast to share my experience as a 39 years old husband and father of two, small business owner with multiple sclerosis (MS). I recorded 33 episodes in Season 1, and I’m currently 9 episodes into season 2. I went online to find podcasts about MS from the patient perspective, and they were few and far between. In response, I started What’s The Matter With Me? to tell my story, so that a story like mine would be told. As I’ve produced the episodes, more and more people with disabilities have reach out to me saying how much it has meant to them. I have created a kind of feedback loop: I support others and in turn they support me. I am in greater touch with my disabled community, especially younger people dealing with disability earlier in life when expectations for robust health can be higher. We need to raise our voices in order to be heard. Even though I resigned from my weekly radio program I am still active at kfjc,. Lst weekend I took my family to a fundraiser event at streetlight records here in San Jose and it was good to see people. And then a couple of days ago I went to the weekly meeting where I reviewed some music and recorded some scripts for production spots that we will make for the fundraiser which is coming up in October.just silly stuff asking for money but I’d like to be part of the community at kfjc which is a bunch of burnout to like music just like I do. One of the listeners from my radio show has since joined the station. she has some disability and says that I inspired her to join. One day she called during my show and told me that she knew someone else who worked at the station and she listened to my show and she heard from her friend that I was disabled. I encouraged her to join the station because it was rewarding and it was something that a disabled person could definitely do and it was a great group, a great and supportive community So I’m very glad that she joined Kfjc and it was great to see her at the meeting. that’s another episode in the books thank you for listening. Japanese proverb tattoos, swimming while disabled. Posted it on reddit and some folks reminded me how scary swimming can be. I watered more this summer, a couple times a week. I haven’t been falling which is good. Because the last time I fell I fell through the fence and it looked kind of rickety for a time. It’s fixed now. Selling hot sauce. I’m starting to write regular emails, reach out to customers and grow my business. I did a hot sauce tasting at a local grocery store where they sell my sauce. It was great to get out there, press the flesh and push the product again, like I did at the Fancy Food Show last season in episode 30. it is exciting but also scary. I tell myself I know what I’m doing, that I have worked at e-commerce companies before. I’m just generally copying what these bigger companies did and applying it in my little business. I try to get out there and to talk with customers, find new ways to sell products every day. I can do it! We went to Monterey on vacation. It was frustrating because I felt very limited by disability. We went to the aquarium which is very beautiful and wondrous. I have a lot of childhood memories there, but in the here and now it was hard to move around in the dark with the jellyfish and crowded area very difficult to walk. I hope my kids had a good time, I did not. It wasn’t something I could just go and do — it was very challenging to navigate the experience, the crowds, and my disability at the same time. When I used to go on vacation I would try and cram everything into my itinerary. Now I need a nap. I need to eat food regularly. I can only travel so far. I love to see things and experience new things, like anyone. It was frustrating for me to be stuck up on the cliff looking down at my childre playing on the beach and not be able to join them because I couldn’t traverse the rocky staircase. It upset me. The bathroom where I was staying was big and beautiful, open with a jacuzzi and all covered in stone and it seemed like a total death trap every time I wanted to shower or brush my teeth. I have such a hard time on vacation because I can’t do what I used to. I need to figure out a new way. I’ve been going through lots of trigeminal neuralgia. I’m switching from one medication to another. It has benefits, like feeling more awake and present, but the changes in medication exacerbate my symptoms. More about TN in S2, E6: Awaker. Check out the Whats The Matter With Me? podcast page on Facebook, please review it and like it — help me get the word out. You can email me using the contact page. The Whats The Matter With Me? Podcast is an MS podcast and it’s also about other things. I’m not a medical professional and you should not take this for medical advice. If you need medical advice, ask your healthcare provider. Last episode featured a movie review of a short film by Jason dasilva, I wanted to try and go swimming, made a movie for Hoppin hot sauce, and my tomato plants were fruiting. Shoutouts to Eric who told me he’d been listening to my pod. Eric lives in Sacramento so he was digging the Sacramento episode. Write me by clicking the contact link at the top of the page and I’ll give you a shout-out, I’m easy. Fall down seven times and stand up eight, this is a Japanese proverb. in short it means something similar to “it’s not whether you win or lose, but how you play the game.” It’s different, I thought it was a poetic image and I felt like it could be good to think about. Because I am always falling down and having to stand up and face challenges. Then I Googled it and I found a bunch of people who have it as a tattoo, and a rock song about it. I had a good idea about it in my mind and then Google image search was just ruining it for me. Sometimes you shouldn’t search for things on the internet. Certainly sometimes it’s plenty to ponder something on your own, and keep the internet out of it. In my mental courtroom, it has all been stricken from the record. On John John’s 5th birthday I went swimming in the pool at my parents house. In the last episode I said I was worried that I wouldn’t be able to get in and out of the pool but I hoped that I would try to get in. My family was there including my Uncle Frank along with my stepfather Dave. When it was time to get into the pool I got a chair, one of those foldable camping chairs, and set down in it close to the pool. My idea was to sit in the chair, and then I would get from there onto the ground and then crawl into the pool. I set down in the chair. Nami and uncle franc came over to help. They helped me stand up from the chair. “I wanted to get down on the ground and then go into the pool,” I told them. They helped me get on my knees, and it seemed rather easy for everybody and I didn’t feel like I would fall. 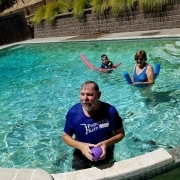 I crawled into the pool, where I played with my kids and my cousins and it was a great time. When it was time to get out, I crawled out, and tried to get up by myself, holding on to the fence. I couldn’t quite get it done, so my stepdad Dave came over and helped me by supporting me on my right side, which is my bad side. I stood up easy. I ripped up my toes on the concrete when I was trying to get up by myself, but it was minor and I cleaned it up easily with a baby wipe. I sat in the shade and thought about how I had been worried about being able to swim, and how happy the kids were to play in the water with me. Thanks to Nami and Dave and Franc and my family for all the support, it was a happy moment. Check out the Whats The Matter With Me? podcast on Facebook, please review it and like it, hate it, whatever — help me get the word out. You can Contact me here. My name is John, I’m 39 years old, husband and father of two, small business owner, radio DJ, podcaster and I have multiple sclerosis (MS), so I made this podcast to share what I’m going through. Last episode, I took MS medicine by infusion and it knocked me out and burned me up, complained about reddit, new brace, I can zip up my own fly, for now. Shout out to Patrick– it turns out he found out about this podcast from the time I posted it on Reddit so in fact even though I thought it was disappointing, I got through to people even though I didn’t see it at first. Patrick is a young father with MS like me. He told me that he was inspired by What’s the Matter With Me? and started his own Ms blog on Facebook called Taking It Day By Day- Patrick’s MS Story. Check it out and many thanks and shout outs to Patrick. I’m just going to keep it rollin’ with the shout outs so shoutouts to Rocky. I know she listens because she responds to the episodes in text messages. She is a librarian and she is trying to get the American Library Association to divest from fossil fuels. She has started to reach out to divestment experts to help amplify her argument from an environmental as well as a financial viewpoint. It’s very persuasive and I will put a link to it in the post on this episode on whatsthematterwithme.org. Shoutouts and thanks for listening Rocky. Click here to listen to her interview. I watched an interesting short film called The Disability Trap by Jason DaSilva, the director of When I Walk, probably the foremost disabled filmmaker. He wrote an op ed in New York Times and as part of it included The Disability Trap, which raised some important questions. Before I get to that I noticed that the movie is about 13 minutes long, I think MS people make stuff that is about 13 minutes long and that’s about right I guess. That’s how I do it too. The film tells how in some states like New York, where Jason lives, the state provides one-on-one in-home care, so he live at home, be more independent and studies show he will have a longer life expectancy. His son lives in Texas, and in order for Jason to move there he will have to live in a home and he will lose a considerable amount of Independence and freedom. The point of his op-ed is that this creates an impossible choice whereby in order to gain proximity to his son he must relinquish his life as he knows it. It’s from the New York Times June 24th edition, called The Disability Trap by Jason DaSilva. It is so important tor me to be present as a father to my son, and I can’t imagine what Jason is going through. It’s John John’s 5th birthday tomorrow and we are going to go to Santa Rosa to be with my parents. We will all go swimming in the pool. I might try and get into the pool it’s kind of hard and I stubbed my toes a lot but I think I will try. I hope it is not too dangerous. Maybe I will try getting in on the deep end. I hope I can still swim. I made the Hoppin Hot Sauce movie where I spoke about how I have MS but I didn’t let it stop me from cooking. I put it on my Youtube channel, and my customer email, where this month it was the top item. I was nervous about it, but the response has been uniformly positive. The gears are spinning and I am working on a few more videos already. Hoppin Hot Sauce is good sauce and social entrepreneurship and I think there’s something very positive about that. I’m going to keep working at it. I’m starting to get tomatoes off the tomato plants and their are pretty ugly but they are delicious. I hope we get a lot more. We put them in salad with oil and vinegar, basil and salt. Mom listened to the podcast, and she told me, “I listened to your pod.” Isn’t it funny how parents do that? They get creative with the lingo. She used to say, Intendo instead of Nintendo, and nowadays she does the same thing with text messages. She calls them tweets. “Tweet me,” shje’ll say. Or, “I tweeted you. Didn’t you get my tweet?” Shoutouts to Mom, love you Mom. Email me using the contact form on the site, and I’ll shout you out. Writhing In Pain, Crunked Up or Crunked Out?, Coaches jackets, living in a hair gel air bubble, making music with my old compadre, accessible instruments, its good to be alive. It’s all in the last episode, check it out. “AAA! !” John John shouted as I bent over to brush his teeth, pointing frantically. I tried to look where he was pointing, but he moved whenever I turned my head to look. “Papa, you’re drooling,” he said, and laughed. I looked in the mirror, he was right, I had drool on my chin. The way things have been going, it was the least of my problems, but its a phobia I have — to become a vegetable. It’s just fear — my drooling scared John John when I was brushing his teeth, it is what it is. If I can keep my mouth shut and stay focused, I’ll be all right. My most major fall since the last episode occurred in the backyard while I was gardening. First off, I am unhurt. I fell through the fence when I was trimming the garrya elliptica wavyleaf silktassel bushes. Completely through the fence, I ended up in my neighbor Tim’s yard. The garrya bushes are low-growing and dense, and they were covering my feet. I reached out a hand to steady myself on the fence, it moved and I fell right through it. Nami helped me put it back together. The posts are cracked and rotting, it seems like the next strong wind will bring it down, but then in the morning it’s still standing. My name is John Hoppin and I created Hoppin Hot Sauce from chiles, Meyer lemon, garlic and spices.. I’ve worked in food all my life. I put hot sauce on everything, grilled cheese, lunch leftovers. It gives it a certain Tang that I prefer. I have multiple sclerosis and it makes it difficult to work in the kitchen environment. I didn’t let it stop me from cooking. I made Hoppin Hot Sauce to share the taste of my table with yours. It’s all natural with no preservatives, and all good stuff inside. For people who want their food to taste the best, nothing beats Hoppin Hot Sauce. It made me feel powerful to write and deliver those lines. I hope it will turn out, I’ll share it with you when I get it out of editing. I’m on less sedation and it’s feeling pretty good to be more alert. Maybe ‘alert’ is a stretch. I’m afraid of more pain, that the pain will wake up and rear its ugly head. For the time being, I am relatively awaker. Live in the present moment.. I had this more-or-less standard revelation listening to music on the way to the farmer’s market. There were a lot of wonderful fruits and vegetables that deserved my attention, and there will be more next week. If I stay focused on the present, not stuck in the past, or woulda-coulda, I think it will help me be happy. Hello and What’s The Matter With Me? Season 2, Episode 4. My name is John I’m 39 years old husband father of two small business owner radio DJ podcaster and I have multiple sclerosis so I made this podcast to share what I’m going through. What’s The Matter With Me? is an MS podcast and it’s also about other things. I’m not a medical professional and you should not take this for medical advice if you need medical advice ask your healthcare provider. Shoutouts to Patrick and Nat. In the previous episode I talked about answering hoppin hot sauce fan mail was my new favorite activity. But maybe answering what’s the matter with me fan mail is even better? neuro psych evaluation trippy wormhole. results later in the episode. 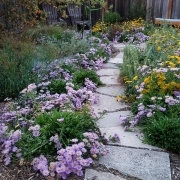 things are blooming in the garden. hoppin hot sauce has started to exist beyond my immediate purview., out of the vicinity. various pains. shoulder has subsided somewhat. My shoulder no longer keeping me up,. 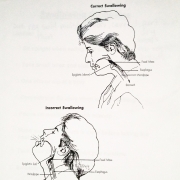 trigeminal neuralgia is worse. it hurts to talk, like stabbing electrical pain in my face, it is unbelievably concerning, it’s worse at night. my back hurts but its almost an after thought. I have a pinched nerve in my neck probably resulting from some bulging vertebrae that were visible on My Last MRI. Falling a lot. Because of my brace? Balance? Hurt my back falling in the yard and it has been aggravated by further falling.